Get a Free Internet Marketing Analysis to Discover How. 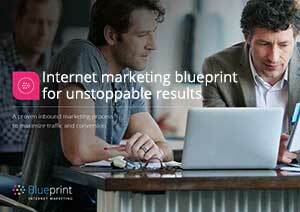 With Blueprint’s internet marketing solutions, your business gets the growth it deserves – are you ready? We develop completely integrated campaigns that are designed to demand the attention of your audience, drive traffic to your website, and turn leads into sales. Strategically designed SEO campaigns enable you to reach new clients with focused precision, locally, nationally, or globally. Outrank your competition and increase your website visitors with proven SEO strategies. Highly efficient and cost effective PPC campaigns reach new customers wherever they live, shop, or search. From Google to Facebook and LinkedIn, we use the right channel to drive qualified visitors to your website. We develop a content marketing strategy that engages your market with quality content aligned to your brand values. We build videos, digital publications, ebooks and more to get maximum impact from your marketing budget. We create websites, micro sites, and landing pages that look exceptional and convert visitors into leads at the highest rate possible. This allows you to get the most out of your advertising dollars. Email automation is used to speak directly to your customers and encourage them to take the next step. While you are enjoying some down time, email marketing works for you building loyalty and trust, and turning leads into sales. Get a free internet marketing analysis to discover how you can get more website visitors, leads, and sales.